So glad you're enjoying rediscovering the series! And yes, those Saga volumes are gorgeous. Thanks for this thread, although I am now a lot less rich than I was before seeing it. I am however much more fortunate, having finally discovered Usagi. Speaking from my own experience, the first Saga book is a pretty good place to start. Even with obvious call backs to earlier, it was very compelling and finished the book within a few days. A quarter of the way through I had ordered the Fantagraphics collection, and Saga's 2 and 3. I found the Fantagraphics a bit harder to get through, it just didn't pick up for me till the second half of the collection, and I may have never gotten there if I wasn't aware of where things were going. This was only about a few weeks ago, I'm now just starting Saga 3, and it's a blast of a series. I've even gone about collecting individual issues, concentrating mostly on the mirage run, for the color versions of those stories. But picking up any issue if it's in my price range at the moment, I'd love a complete run of singles. I really wish I have finally say down to read this years ago. Welcome to the board, my friend, and congratulations on discovering Usagi! It truly only gets better from where you currently are in your reading. And you absolutely must read Space Usagi as well, which is my favorite version of the character! Thank you. And Space Usagi is on my list, I've pre-ordered the hardback for later this year, as all I've found in my comic store is issue 1. I'm looking forward to it, and Senso, but trying not to jump the gun and will get to that in time. You can read Space Usagi at any point in regular Usagi continuity. Senso may contain some spoilers though. I loved the pin up by David Petersen of Mouseguard fame at the end of Saga Vol.5, I'd love to see him do a full Usagi story. Bought everything Dark Horse had on sale digitally a few months back and now with their Not @ SDCC sale have bought they rest of what they have available in collections. I've always meant to get more Usagi but Shaxper's praise for the series nudged me to get it sooner than later and I'm just finishing volume 7 now of the Saga. For some weird reason DH doesn't have volume 8 available digitally nor the individual issues. Does anyone know why ? I'd prefer to keep everything digital. Call me crazy, but jumping from paper to digital or vice versa breaks the continuity flow for me and just doesn't mesh. Why this hasn't become an animated series is beyond me. And the amount of attention Usagi got in the TMNT series last year has made me wonder if someone is seriously considering Usagi's multimedia potential once again. Since hearing so much about Usagi Yojimbo on this forum, I got the Saga Edition Vol 1 shown above as my first read. It began with a confusing story, namely the Ninja Turtle crossover. The problem with that story is that it has a large number of characters and thus can't really focus on the protagonist. Also, fitting them all into the frame made for some really crowded B&W art, and with four turtles who look identical, understanding the action was not easy. 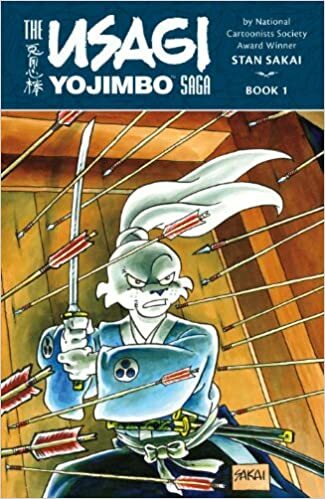 I liked it much better when that story was done and the action moved to the sword stolen from the battlefield, Usagi infiltrating the war band which took over the town, Usagi and the princess having their "The Bodyguard"/"Crouching Tiger" adventure, etc. 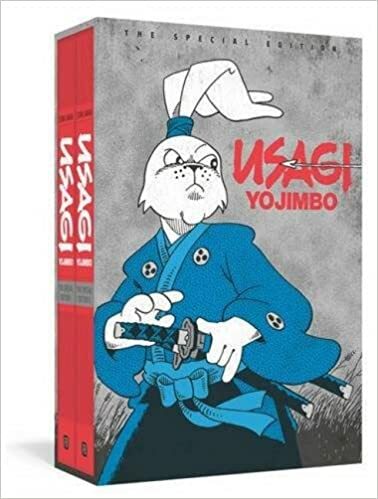 So, why does Vol 1 of the Saga Edition actually not collect the first volume of Usagi Yojimbo? Is it a rights thing? I noticed that even the earliest stories in the Saga Edition had footnotes referring to previous stories. Different publisher. As the op indicates, you need The Special Edition to read the original stories published by Fantagraph. Would have been nice if Fantagraph and Dark Horse could have coordinated on the Saga Editions, but it didn't work out that way.